Bodisch was appointed Department of Public Safety Chief of Staff and Assistant Director of Texas Homeland Security, which included among a number of responsibilities the Texas Division of Emergency Management, in August 2009. Bodisch started his 45-year law enforcement and criminal justice career in 1973. He served as a deputy sheriff with the Harris County Sheriff’s Department (1973 – 1975), lieutenant investigator with the Harris County District Attorney’s Office from 1975 to 1984 and was chief investigator with the Texas Prosecutor Council in 1985 and senior criminal investigator with the Texas Attorney General’s Office from 1985 to 1989. 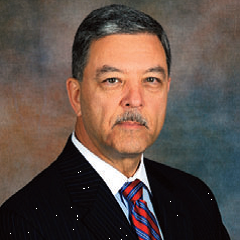 He served as the Director, Governor’s Texas Narcotics Control Program from 1996 to 2001. Bodisch served as the Director of Education and Training for the Texas Commission on Law Enforcement Officer Standards and Education from 2002 to 2005 and assistant director of the Office of Special Investigations for the Texas Attorney General’s Office in 2006. He served two tours of duty in Iraq (2005 & 2007) working for the Department of Justice, International Criminal Investigative Training Assistance Program (ICITAP). Director Bodisch's first tour of duty in Iraq started on 21 January 2005 and he was assigned as the manager of the Iraqi Police Executive Leadership Development Team from January to April. From April to June he served as the Plans and Projects Officer at the Civilian Police Assistance Training Team (CPATT) Headquarters. During this period (January - June) Director Bodisch also applied his skills and talents instructing and supporting Coalition and Iraqi working groups to detect, deter and defeat improvised explosive devices (IEDs), the preferred method of insurgent attacks in Iraq. In June Director Bodisch was assigned as the Senior Law Enforcement Advisor to the then Ministry of Interior Police Partnership Program (MOI P3) which evolved into the Ministry of Interior Transition Team (MOI-TT). As the Senior International Law Enforcement Advisor, Director Bodisch directly advised Iraqi Ministry of Interior senior officials responsible for national level police programs, capabilities and sustainment. From July to December, Director Bodisch developed and spearheaded an initiative to assess the ability of the Ministry of Interior's ability to develop and sustain police, facility protection forces, criminal investigators and intelligence agents, and border forces. The assessment team consisted of more than 25 coalition personnel working in 12 functional areas across the Ministry, with an investment of approximately 8,000 man-hours. The results of this comprehensive assessment were essential to determining the next focus areas in the Coalition's mission to develop the Iraq security ministries. Director Bodisch also instructed Coalition team members in tactical convoy operations and conducted at least 40 tactical convoys between the International Zone and the Ministry of Interior/Forward Operating Base Shield and other locations within the “red zone” without incident. Check out the incredible speaker line-up to see who will be joining Major General Robert J..